Wireless network mode engineers can schematically diagram with help of the ConceptDraw DIAGRAM best Network Diagramming software. Wireless Networks solution from ConceptDraw Solution Park extends ConceptDraw DIAGRAM to help network engineers and designers efficiently illustrate wireless network mode diagrams. Sample 1. 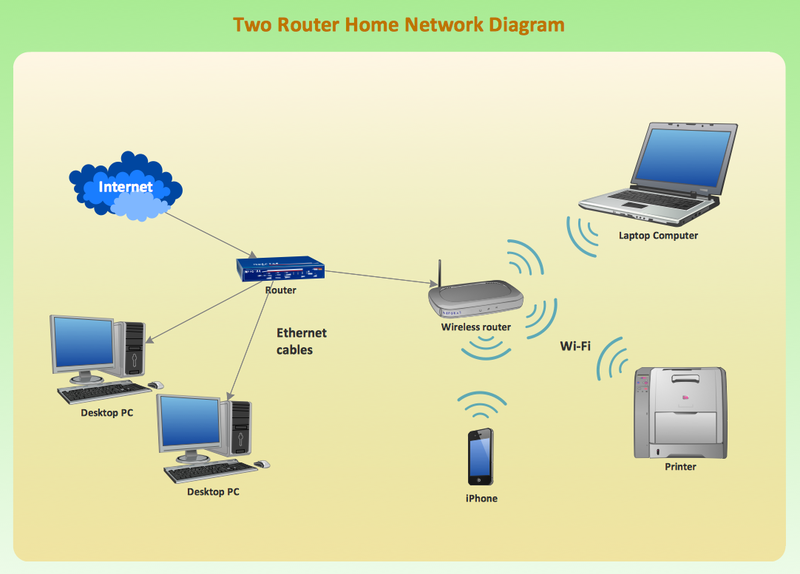 Two Router Home Network Diagram. This network diagram example illustrates topology of two router home WLAN. Wireless Network solution contains template, library and a set of design elements that help network engineers visualize Wireless Network. Network engineers and designers use this solution to design, create and illustrate the wireless networks.